Sabiha Nahar Begum, (M.P) born on 15th January, 1950 graduated from Chittagong Bangladesh is an Honorable Member of the National Parliament-349 and Women Constitution No. 49 of Bangladesh National Parliament Govt. Peoples Republic of Bangladesh. She is also the Member of Parliamentary Committee of Ministry of Civil Aviation, Transportation & Tourism Bangladesh. She was the Former President of North District Women Awami League, Counselor Chittagong City Corporation, Joint Secretary & Advisor of Chittagong Writers Association, Former President & Chairman of Mamata Seba Project, Former Member of Executive Committee Chittagong Divisional Organization of Sports. She is a successful women entrepreneur and also the owner of Tulip Print & Accessories Ltd.
She is a life Member of many social & charitable organizations Chittagong Maa O Shishu Hospital, Chittagong Diabetic Association, Bangladesh Women’s Association, and BWA Planning Association & Chittagong Academy. 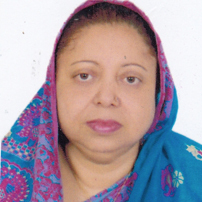 Mrs. Sabiha Nahar is the Founder President of Golfaham-Nurul Alam Distressed Foundation. She is also one of the Founder Members of Chittagong Women Chamber of Commerce & Industry (CWCCI). She has also participated in many national and international conference & seminar on tourism. She has visited many countries in home and abroad. She is also the author of a reader worth book titled -“Balaka Maan”. She is happily married and blessed with two sons and one daughter.